For dinner tonight, we had a delicious meal. The broth was a classic dashi made from kombu and katsuobushi. 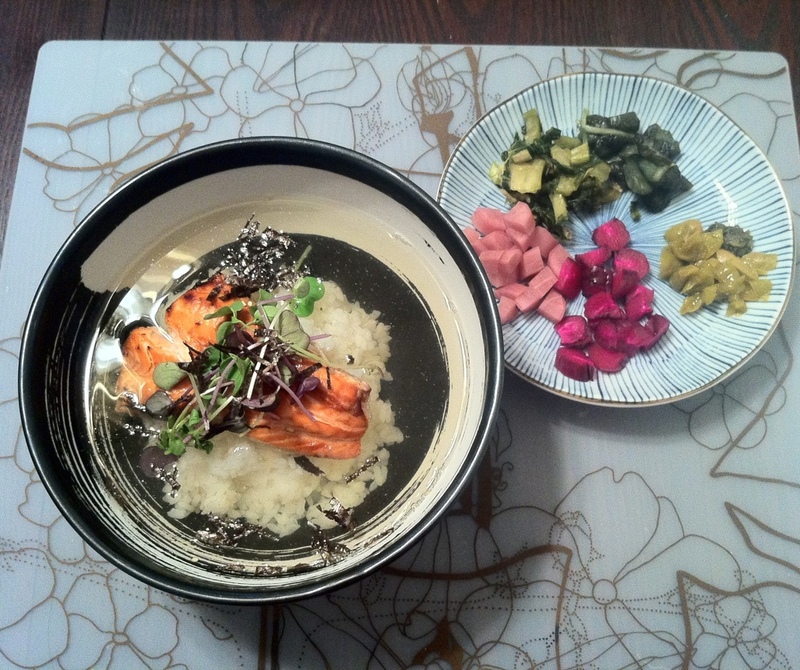 It was over plain rice, with a piece of broiled salmon, radish sprouts and nori sprinkles. Making dashi from scratch is somewhat tedious, but this was certainly delicious. We added a little bit of the shiso leaf from our homemade ume pickles (chopped on right of the pickle plate) for that little bit of characteristic flavor. Overall a simple, but extraordinarily delicious meal. Tonight we tried Ramen Parlor in San Mateo. In addition to their ramen offerings, they have an izakaya type menu with yakitori, fried bits, and even curry rice. We had a few tasty appetizers, including yakitori chicken breast with yuzu kosho, yakitori pork cheek, fried oysters, and spicy cucumber quick pickles. All were quite good. Now to the ramen. The tonkotsu broth with lobster oil was really exceptional. It had a wonderful umami and seafood flavor. The noodles were quite good, nice consistency/texture and flavor. The add ons were overall good. The black mushrooms also had a great flavor and mouthfeel. The mizuna (mustard greens) were quite good. The egg (an extra) was a over-cooked, but it had a good flavor. There were a few nice pieces of nori. The chashu had a good mouthfeel, and certainly looked nice, but after the wonderful yakitori and maybe compared to the umami of the broth, it seemed a little under flavored. There was half a softshell crab on the top, and I was a bit skeptical of course, but it was a good addition overall. I let it soak a bit in the broth and ate it in a few quick bites. Overall, Ramen Parlor is a definite recommend.